Plato's legend of Atlantis has become notorious among scholars as the absurdest lie in literature. Atlantis Destroyed explores the possibility that the account given by Plato is historically true. 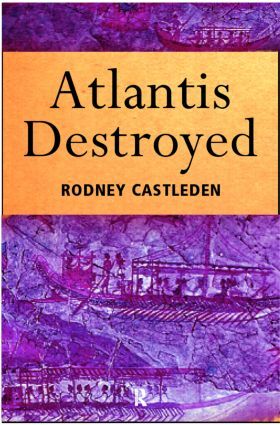 Rodney Castleden first considers the location of Atlantis re-examining two suggestions put forward in the early twentieth century; Minoan Crete and Minoan Thera. He outlines the latest research findings on Knossos and Bronze Age Thera, discussing the material culture, trade empire and agricultural system, writing and wall paintings, art, religion and society of the Minoan civilization. Castleden demonstrates the many parallels between Plato's narrative and the Minoan Civilization in the Aegean. Fired by the imagination a new vision of Atlantis has arisen over the last one hundred and fifty years as a lost utopia. Rodney Castleden discusses why this picture arose and xplains how it has become confused with Plato's genuine account. Rodney Castleden has been actively involved in research on landscape processes and prehistory for the last twenty-five years. He is the author of The Making of Stonehenge, The Knossos Labyrinth and Minoans.